This story was updated at 3:52 p.m. EDT. NASA willfuel up the space shuttle Endeavour?s massive external tank next week to checkrepairs aimed at stopping a hydrogen gas leak that has twice delayed thespacecraft?s launch. Set forWednesday, the so-called ?tanking test? will fill Endeavour?s attached 15-storyfuel tank with the 526,000 gallons of super-cold liquid hydrogen and liquidoxygen propellant needed to launcha shuttle into orbit. During two launch attempts this month, an excessiveleak of hydrogen gas from the fuel tank forced NASA to stand down during thefueling process. The shuttle is now slated to launch no earlier than July 11. It takesabout three hours to fuel a shuttle external tank, during which time some ofthe cryogenic liquid hydrogen boils off and must be vented away from the launchpad and safely burned off to avoid an explosionrisk. NASA engineers believe a misalignment in a Teflon seal between thevent line and Endeavour?s external tank allowed some of the flammable hydrogengas to leak out during launch attempts on June 13 and June 17 at the KennedySpace Center in Cape Canaveral, Fla.
?They thinkthey have a pretty good handle on what they think caused the leak,? NASA spokesperson Candrea Thomas told SPACE.com fromthe Florida spaceport. ?The tankingtest will tell, but hey?re confident they?ve got this thing figured out.? Engineersare working to install a new Teflon seal and special washers to fill in the gapcaused by the misalignment, Thomas said. Endeavourand its seven-astronautcrew are poised to launch an ambitious 16-day mission to the InternationalSpace Station to deliver the final piece of the outpost?s $1 billion KiboJapanese laboratory. The astronauts plan to attach a porch-like external experimentplatform to Kibo and perform five daunting spacewalks during the flight. 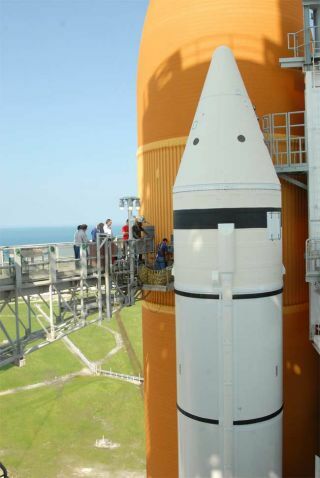 The shuttleis currently scheduled to launch on July 11 at 7:39 p.m. EDT (2339 GMT), butcould launch anytime through July 14. If the shuttle cannot launch by then, itwould have to wait until July 27 to allow a previously scheduled unmanned Russiancargo ship to dockat the station. That Progress freighter is due to launch from the CentralAsian spaceport of Baikonur Cosmodrome in Kazakhstan on July 24 and arrive atthe station a few days later. NASA plansto begin next week?s fueling test for Endeavour at about 7:00 a.m. EDT (1100GMT) on Wednesday, Thomas said. The test will be broadcast live on NASA TV, sheadded.